Working with our partners Kopernik, we at Human Relief Foundation will provide Aqaba refugee camp in Jordan with solar powered lamps to provide the Aqaba refugee camp with light, so those living in hardship can benefit from security, health, education and an improved quality of life. 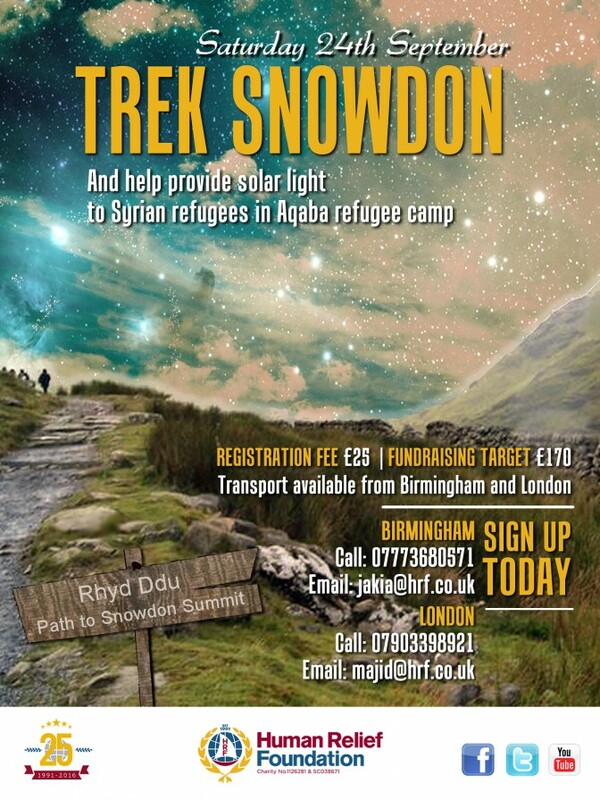 HRF have organised a Snowdon trek for Saturday 24th September in order to help raise funds to make this vision come true. Every donation would be hugely appreciated. If you are not able to donate, please share the page so others are able to do so instead and InshaAllah you will be immensely rewarded for that too. To refugees living in camps, the importance of light and electricity goes well beyond comfort and means a lot more than it does for us – it stands for security, health, education and an improved quality of life. Despite its importance, nights are often dark in refugee camps around the world, which provide homes to millions of displaced individuals seeking shelter in the wake of natural catastrophes or wars. Finding a reliable, flexible and affordable source of electricity for refugees can have dramatic implications on their living situation. A donation of as little as £1 can go a very long way for these refugees who are in desperate need of any aid they can get. Renewable energy technologies like the solar powered lamps can transform sunlight, wind, or water - into electricity. This can provide many benefits to people in the camp. Children will have access to adequate lighting at night so they can do their homework (thus resulting in a lower drop-out rate at the local school). Education will be vastly improved and children will benefit. Small business owners can use the light to support their activities after sunrise and continue making a living for their families. The lamps can also provide an income for many households. Using the lamp, beneficiaries can earn a small yet sustainable income by charging others to charge their mobile phones easily. Those who travel internally within the camp will be and feel more, safe. They will be able to use the portable lamps to see in the dark and this will also help prevent violence, particularly against women.